At Herbert S. Birnbaum, DMD, we offer more than dental care – we offer patients a comfortable dental home. By combining our commitment to exceptional dentistry with our passion for personalized care, Herbert S. Birnbaum, DMD provides patients and families throughout Newton Centre with a trusted, welcoming dental home. Having worked alongside his father during the early years of his private practice, Dr. Birnbaum’s patient philosophy was inspired by watching and mirroring his father’s dedication to exceptional dentistry. As an experienced and renowned dental technician, Dr. Birnbaum’s father instilled the importance of high quality, personalized dentistry in creating beautiful, healthy smiles. Over the years, meticulous attention to detail and a dedication to compassionate care have become the foundation of our practice. At Herbert S. Birnbaum, DMD, we value the personal relationships we form with our patients. Rather than rushing into care, we get to know our patients. During your first visit, our team helps you feel comfortable, answering any questions and concerns you may have before going into treatment. Patient education plays an important role in providing comprehensive preventive care. We pride ourselves in keeping our patients well-informed, and aware of their options. This starts with utilizing the latest dental diagnostic technologies in order to provide patients with a current, in-depth understanding of the condition of their smile. With tools like digital x-rays and the CariVu decay detection system, our Newton Centre dentist is able to point out vulnerabilities in the smile to patients. By using these advanced diagnostic technologies, Dr. Birnbaum is able to walk patients through their different treatment options, empowering individuals to make the final decision in their dental care. Our dedication to patient-oriented dentistry goes beyond the in-office care our patients receive. As a long-standing faculty member of the Harvard School of Dental Medicine, Department of Restorative Dentistry, Dr. Birnbaum remains at the forefront of dental innovation and frequently brings new developments back to his patients. As a mentor for students at Boston University, our Newton Centre dentist is dedicated to fostering a passion for patient-first care in upcoming generations of dental professionals. In addition to multiple recognitions by Harvard School of Dental Medicine, Dr. Birnbaum is frequently recognized by a number of local and regional publications. In particular, our dentist is regularly recognized as one of Boston’s Top Rated Dentists by the Boston Consumer’s Checkbook. 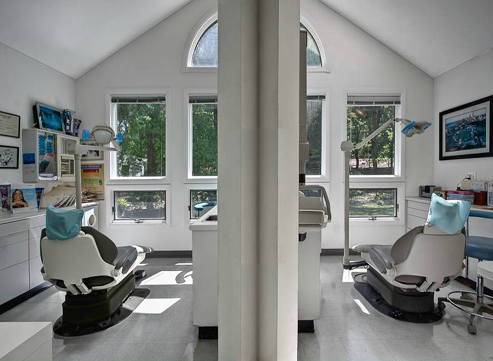 Located off Beacon Street in Newton Centre, MA, Herbert S. Birnbaum, DMD is proud to provide the highest quality dental care in a warm, attentive environment. To learn more about our services, schedule your next appointment with our team today.